The results of our first visitor poll are now in and it's a resounding "yes" for the modern machine. More than half of the 120 voters said their favourite era of mower was "Post 1945". This might come as a bit of a surprise to some collectors but the votes don't lie. Thanks to everyone who voted. There's a new poll to try out and we'll await the results with keen interest. Meanwhile, the results of the first poll are included below. 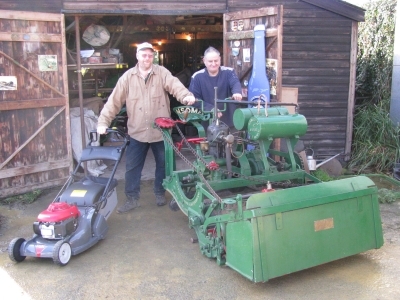 The Hall & Duck Trust has won a competition organised by Honda to find the UK's oldest working motor mower. The winning machine was the 1902 Ransomes motor mower that many club members know as "The Cadbury Machine". Club members Mike Duck and Andy Hall found the mower some years ago and restored it to working order and it's been to a number of events since. The prize for winning the competition was a brand new Honda rotary mower. They've been featured in a number of magazines and on the radio as a result. You can read more here on the BBC website here.